Debbie's Treasures: Happy New Year! 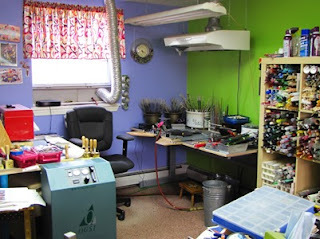 Here's a pic of my torching studio. I know it's messy! I'm cleaning up this week to start fresh for the new year. Check out my glass rods on the right(that's only about 1/4 of my glass),my pink torch on my desk,ventilation overhead,red kiln behind me & lots more. This is where I spend 8 hours a day! You can't see in the pic but the rest of the room has my metalworking station & my office.